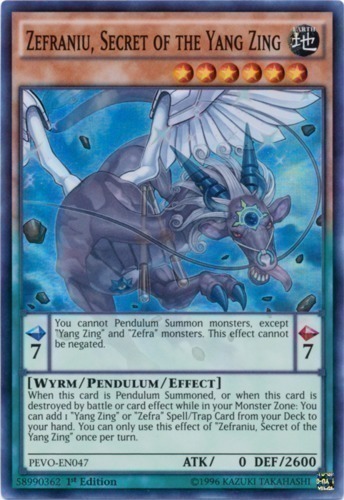 Pendulum Effect: You cannot Pendulum Summon monsters, except "Yang Zing" and "Zefra" monsters. This effect cannot be negated. Monster Effect: When this card is Pendulum Summoned, or when this card is destroyed by battle or card effect while in your Monster Zone: You can add 1 "Yang Zing" or "Zefra" Spell/Trap Card from your Deck to your hand. You can only use this effect of "Zefraniu, Secret of the Yang Zing" once per turn.